Gamari or White teak (gmelina arborea, family: verbinaceae) is a fast growing deciduous tall tree with branches attaining a height of 15-35 m. Young shoots are hairy. Bark is whitish and smooth, beautiful. The trunk can be 3-4 m in diameter. It is a suitable tree for rapid forestation. It is liked to the local people for its light but durable timber. The tree is available in Chittagong and Chittagong hill tracts and Sylhet's hilly area. Leaves are opposite, 23-24 cm long and 15-156 cm wide, broadly ovate-acuminate, light green above, smooth; almost white and hairy beneath. Petiole 6-10 cm long. It sheds leaves during the winter. Flowers are brownish yellow, scented, sepals 5, petals 5, terminal, bilabiate (2-lipped), 3-3.5 cm long, slightly hairy. Flowers bloom in the middle of spring. Fruit is a drupe, 3 cm wide, smooth and green when raw, yellow, juicy and smells good when ripe. seeds 1-2. Propagation of the plant is caused by seeds. Its leaf, fruit and bark have medicinal value. It is used to prevent decay of muscle. Its leaves and fruits are used as fodder. It is quite a beautiful tree. 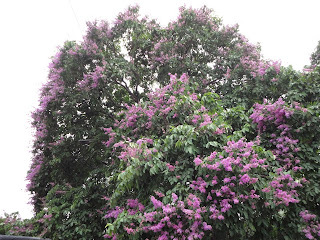 Nowadays, it is planted in residential areas and parks and gardens. Its an Indian subcontinent species.